As the elephants march around the stained-glass shade over the billiard table, these famous gentleman are having a Grand Ol' Party. President Lincoln stands tall as he gets ready to make his shot. Wouldn't you just love to know what he and President Roosevelt have said to each other? It appears that the game is on and Honest Abe is "Callin' the Blue." 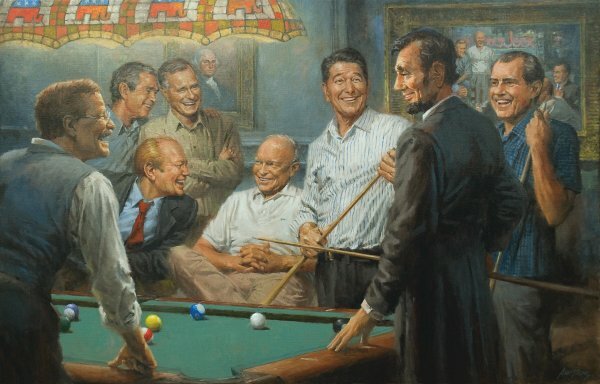 These Republican presidents are enjoying each other's company as our great nation's first president's portrait casts his spirit over them. And, from looking at the other painting on the wall, these historic figures have played this game together before. Can you name all the presidents in this image?